This is “Introduction to Complex Numbers and Complex Solutions”, section 9.6 from the book Beginning Algebra (v. 1.0). For details on it (including licensing), click here. Perform operations with complex numbers. Solve quadratic equations with complex solutions. Up to this point, the square root of a negative number has been left undefined. For example, we know that −9 is not a real a number. There is no real number that when squared results in a negative number. We begin the resolution of this issue by defining the imaginary unitDefined as i=−1 and i2=−1., i, as the square root of −1. Therefore, the square root of any negative real number can be written in terms of the imaginary unit. Such numbers are often called imaginary numbersThe square roots of any negative real numbers.. Example 1: Rewrite in terms of the imaginary unit i. Since multiplication is commutative, these numbers are equivalent. However, in the form 22i, the imaginary unit i is often misinterpreted to be part of the radicand. To avoid this confusion, it is a best practice to place the i in front of the radical and use 2i2. where a and b are real numbers. Here a is called the real partThe real number a of a complex number a+bi. and b is called the imaginary partThe real number b of a complex number a+bi.. For example, 3−4i is a complex number with a real part, 3, and an imaginary part, −4. It is important to note that any real number is also a complex number. For example, the real number 5 is also a complex number because it can be written as 5+0i with a real part of 5 and an imaginary part of 0. Hence the set of real numbers, denoted R, is a subset of the set of complex numbers, denoted C.
Adding and subtracting complex numbers is similar to adding and subtracting like terms. Add or subtract the real parts and then the imaginary parts. Solution: Add the real parts and then add the imaginary parts. To subtract complex numbers, subtract the real parts and subtract the imaginary parts. This is consistent with the use of the distributive property. Solution: Distribute the negative one and then combine like terms. The distributive property also applies when multiplying complex numbers. Make use of the fact that i2=−1 to resolve the result into standard form: a+bi. Solution: Begin by applying the distributive property. Given a complex number a+bi, its complex conjugateTwo complex numbers whose real parts are the same and imaginary parts are opposite. If given a+bi, then its complex conjugate is a−bi. is a−bi. We next explore the product of complex conjugates. To divide complex numbers, we apply the technique used to rationalize the denominator. Multiply the numerator and denominator (dividend and divisor) by the conjugate of the denominator. The result can then be resolved into standard form, a+bi. Solution: In this example, the conjugate of the denominator is 1+2i. Multiply by 1 in the form (1+2i)(1+2i). To express this complex number in standard form, write each term over the common denominator 5. 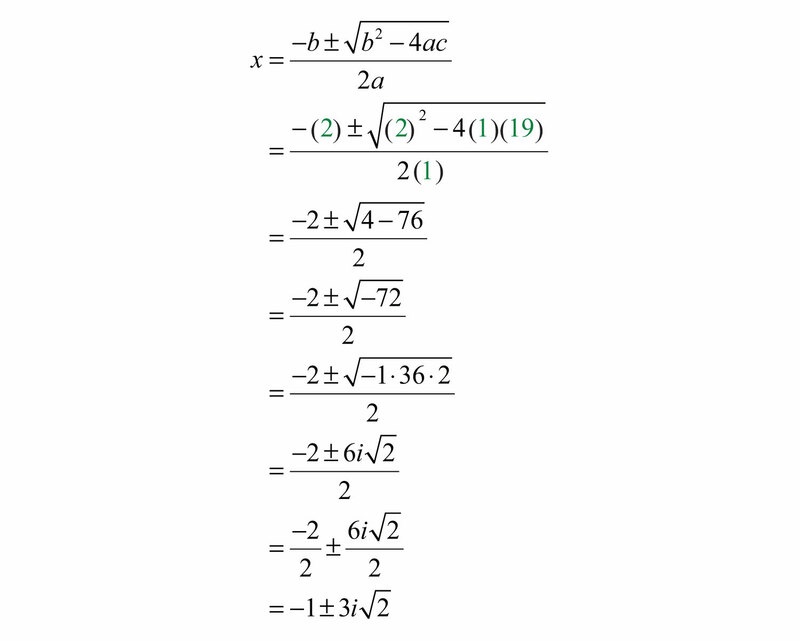 Now that complex numbers are defined, we can complete our study of solutions to quadratic equations. Often solutions to quadratic equations are not real. Substitute these values into the quadratic formula and then simplify. Check these solutions by substituting them into the original equation. 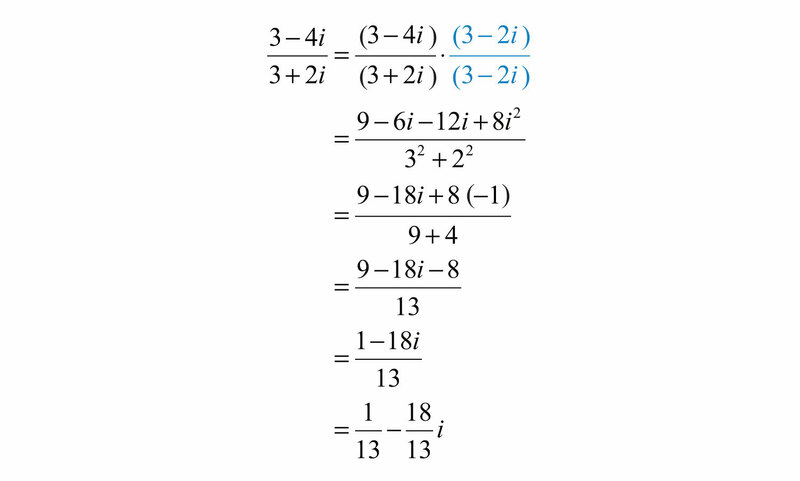 Answer: The solutions are 1−2i and 1+2i. The equation may not be given in standard form. 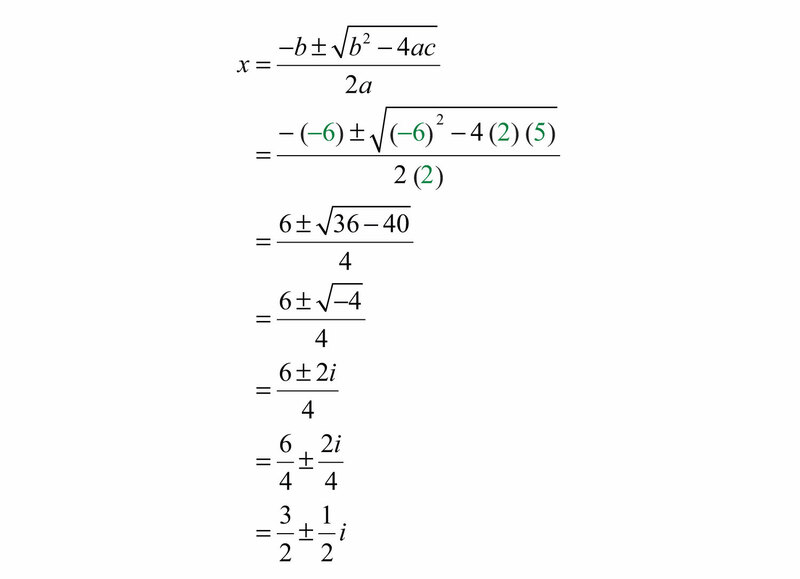 The general steps for solving using the quadratic formula are outlined in the following example. Step 1: Write the quadratic equation in standard form. Step 3: Substitute the appropriate values into the quadratic formula and then simplify. Answer: The solution is 32±12i. The check is optional. Solution: Begin by rewriting the equation in standard form. Here a=1, b=2, and c=19. Substitute these values into the quadratic formula. Answer: The solutions are −1−3i2 and −1+3i2. Both numbers are equivalent and −1+32i is in standard form, where the real part is −1 and the imaginary part is 32. However, this number is often expressed as −1+3i2, even though this expression is not in standard form. Again, this is done to avoid the possibility of misinterpreting the imaginary unit as part of the radicand. The result of adding, subtracting, multiplying, and dividing complex numbers is a complex number. 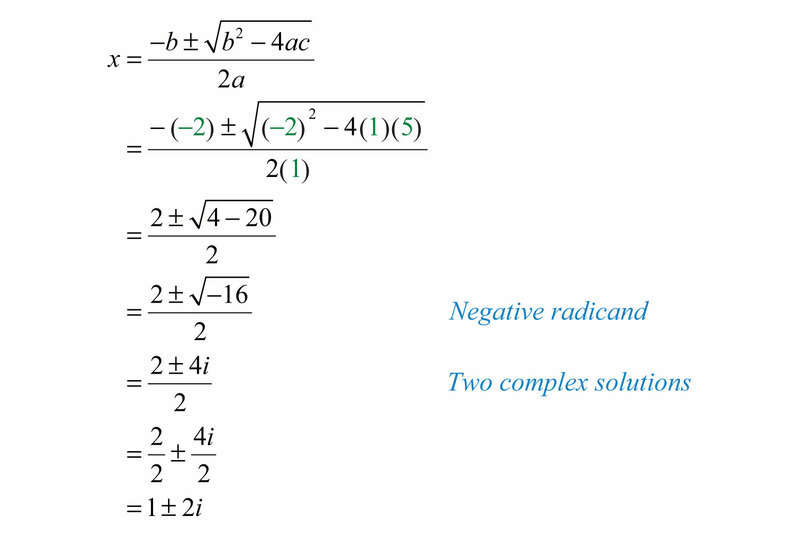 Use complex numbers to describe solutions to quadratic equations that are not real. Rewrite in terms of i. Solve by extracting the roots and then solve by using the quadratic formula. Check answers. 91. Explore the powers of i. Share your discoveries on the discussion board. 92. Research and discuss the rich history of imaginary numbers. 93. Research and discuss real-world applications involving complex numbers.